Ever since KPFK-FM 90.7 (where I host a radio show every Thursday at 3 p.m.) booted off an anti-Semitic radio show that had close ties to the notorious La Voz de Aztlán, Southern California's premier spewers of bile have had a hard time getting their twisted views heard outside their tiny circle jerk. But that changed last week, when Latina students at Long Beach State organized a conference celebrating the school's Chicana heritage. An article on the school's Daily 49er website about the conference apparently became a forum for La Voz head pendejo Hector Carreón and his minions to leave a slurry of anonymous homophobic comments--we say "apparently" because those comments are now gone. But, as always, La Voz de Pendejos leave their markers wherever they drop their Internet caca! A Daily 49er article last week by Conciencia Femenil, the Long Beach St. group that organized the Chicana Feminism Conference, detailing the homophobia they faced made mention of one comment in particular: about some "Aztec Law." 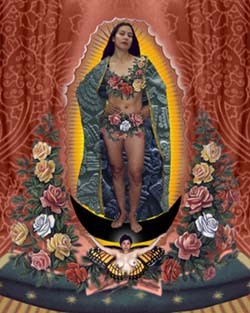 It also revealed that the comments made nasty remarks about Chicana artist Alma Lopez, who once created a mixed-media image of the Virgin de Guadalupe in which she imagined herself as the Empress of the Americas. Both of the mentioned incidents are La Voz de Pendejos classics. The "Aztec Law" bit is an anti-gay screed purportedly revealing how the Aztecs dealt with homosexuals in which Carreón left quite a few treasures: that feminism is a Jewish conspiracy to "emasculate" Mexican men, and that Jews also promote homosexuality "in order to destroy our culture." And Alma Lopez has received previous harassment by Carreón and his crew before. Amazingly, even after the Daily 49er removed their moronic comments, and Conciencia Femenil bared their fears and anger about homophobes, La Voz idiots struck again. One commentator left the same Aztec law pendejadas again, which the Daily 49er quickly took down. "The comments by [the pendejo commentator] citing La Voz de Aztlán have been removed because it was brought to our attention that the group has been cited as a hate group by both the Southern Poverty Law Center and the Anti-Defamation League," the website's administrator posted in a note left yesterday. "We apologize for any discomfort our reader's may have felt in the comments, and the Daily 49er will work to ensure that hate groups do not use our Web site as a forum for hate speech." Homophobia and race supremacism at Long Beach St.--maybe La Voz de Pendejos should hook up with Kevin MacDonald? Bravo to these Chicana feministas for organizing such an important conference and for confronting this retrograde dinosaurio of hate! Carreon is a cop. Most cops operate on the extremes as a way to undermine movements. His police propaganda (i.e. La Voz) is a convenient tool to undermine everyone from mainstream politicians like Villaraigosa to REAL leftists advocating REAL change, because it serves the RIGHT wingers anti-Mexican sentiments. Miguel: Carreón isn't a cop--just a pendejo.